It’s axiomatic that the exercises which give you the best results are always the hardest ones to do. If you want a huge back… you row and deadlift. If you want huge legs, you squat… OR… you do THIS leg exercise – that almost no one wants to do because its one of the hardest of them all. Which one am I talking about? FRONT SQUATS! There are two styles of front squatting, the Olympic lifting style and the crossed arm style. I find that most athletes, and of course Olympic lifters, use the former, while most bodybuilders seem to prefer the latter. The barbell should generally be your weapon of choice, but for bodybuilders, front squats on the smith machine are an outstanding alternative. The Smith machine front squat takes some of the balance issues out of the picture, which allows the physique athlete to really focus on working the muscle rather than worrying about balance and stabilization. Be sure to rotate between both versions, however– barbell and smith machine – because long term overuse or dependency on machines may lead to stabilizer weakness or muscle imbalances and variety is never a bad idea in the physique game. Incidentally, the barbell front squat is an outstanding “core” exercise. A third version of the front squat worth considering is the dumbbell front squat (especially the sumo or wide stance version). These can be performed holding a single dumbbell with both hands on the front of the shoulders, cupped between both hands (goblet squat) or with two dumbbells, one in each hand, resting on top of each shoulder. The limiting factor on these front squat variations is often the poundage, as holding heavy dumbbells can become unwieldy. This can be partially overcome by performing the dumbbell front squat last in a leg workout or second in a superset, or by manipulating tempo and range of motion so the exercise is made more difficult. The dumbbell variations are also a great choice for women who usually don’t require as much weight as men for stimulation. You can also emphasize the medialis and increase overall effectiveness by working FULL squats (breaking parallel) and only coming up three quarters (no locking out). Have you ever seen Mr. Olympia Ronnie Coleman’s workout videos? 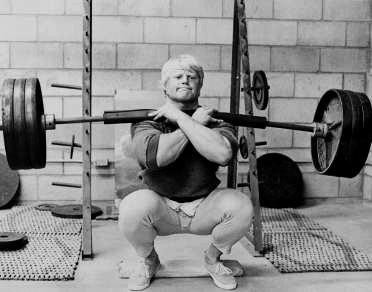 I realize that Mr Olympia’s bodybuilding video tapes are not “workout instruction” nor do they really have anything to do with us mere mortals, but I pay attention to everything in the world of bodybuilding, and I did find it very interesting to watch Ronnie front squatting 500+ pounds. I also found it interesting that he went rock bottom and he did ¾ reps without releasing tension for even a single rep. Although he certainly has some advantages over other bodybuilders, everything is relative and he has some ridiculous quads, even compared to other IFBB pros. Indeed, continuous tension ¾ reps are a tremendous technique to employ with the front squat exercise, regardless of whether you’re a novice or a pro. Be prepared to leave your ego at home, however. In addition to the ¾ reps, try manipulating your tempo. It will limit your poundage even further, but what you sacrifice in strength you will make up in hypertrophy. Whereas a regular rep might be 2011 or 3011 tempo, or even a full-out explosive concentric with a controlled eccentric, bodybuilders may want to try utilizing a tempo of 3020, or (even harder) 4030. With sets of 10 -12 reps, this will give you a minimum of 50-70 seconds of continuous time under tension. The lactic acid burn around the 10-12thth rep has to be felt to be “appreciated.” The only thing more difficult than continuous tension/non-lockout ¾ reps are continuous tension, non-lockout reps with a slow tempo. Truly a quad killer! So if front squats are so good, why don’t more people do them? Simple – because they’re damn hard. Here is what I usually see happen: Someone will start front squatting (or try to), and they inevitably put on way too much weight. Their form is horrible, it feels totally uncomfortable and unbalanced, so our novice front squatter quits and writes off front squats for good after only one try, and heads back over to the leg press machine. I usually advise them to unload the bar and master the form first with very light weights, but invariably, ego gets in the way, and 315-405 squatters and 1000+ pound leg pressers don’t want to be seen with a single “wheel” (45 pound plate) on each side of an Olympic bar while they patiently master the technique for a new exercise. Alas, they never learn to front squat, they go back to what is easy and familiar and they never gain all the benefits of this awesome exercise. Man, this article is truely the best article ever written.